Caltex Introduces New Award for Interclub Knockout Tournament | Welcome to Chevron Lubricant Lanka PLC. 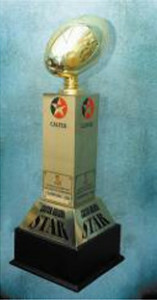 Caltex is a name synonymous with interclub rugby. As the sponsor of the interclub league and knockout tournaments since 2000 and the under 23 rugby tournament introduced this season, the organization has pledged its support to the SLRFU to carry the game forward till 2010 – ten consecutive years of sponsorship. The renewal of this agreement by Caltex in February this year witnessed the introduction of elaborate plans by the Union as a means to enhance and grow the game.